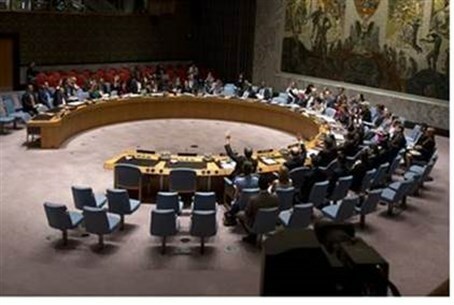 The UN Security Council held the critical vote on the Iranian nuclear deal between the Islamic Republic and the West on Monday afternoon, at 9:00 am EST (4:00 pm IST) in New York. Anticipation is high ahead of the vote, after New Zealand announced Friday that the vote would be held "under silence." In an “under silence” adoption procedure, instead of the UNSC holding a normal positive vote, the motion that is set for adoption “under silence” is deemed automatically adopted unless a party specifically objects to the motion. This “under silence” procedure would put the onus on Israel to be the first, and possibly the only, objector to the UNSC’s adoption of the Iran deal. The draft resolution, deemed 2231-2015 was adopted unanimously by 15 votes in favor very soon after the meeting began. US Ambassador to the UN Samantha Power spoke praising the deal shortly thereafter, explaining that, in her view, the terms of the deal will significantly delay Iran's nuclear development to the point of preventing them from developing a nuclear weapon. The JCPOA (Joint Comprehensive Plan of Action) will take effect within 90 days, she said, and sanctions will be lifted only after it is determined that Iran is compliant with the deal. She added that the deal proves lessons "about enforcing global norms" and "the unity of this council [i.e. the UNSC]," as well as praising the deal for "achieving objectives peacefully" vis-a-vis the Middle East without resorting to war. Power also said that the US will continue to invest in the security of its regional allies and enact its own sanctions against Iran, over protest over its human rights violations and targeting of the US and Israel. She called on Iran to release American captives. "Implementation is everything," Power added, and called on the UN and other international organizations to be strict about ensuring that Iran complies with the deal, explaining that it is critical for world security. Power concluded by urging the UN to apply similar global measures and "the same political will" to other world conflicts, specifically Syria. The French, Spanish, European Union (EU), German, Lithuanian, Chadian, Malaysian, Nigerian, Angolan, Jordanian, Chilean, Venezuelan and Chinese ambassadors to the UN welcomed the resolution as well, with Chinese ambassador Liu Jieyi stressing the importance of "comprehensive implementation" of the deal. Russia also praised the deal highly; Russian ambassador to the UN Vitaly Churkin spoke of the '"inalienable rights" for the Iranian people to develop a nuclear program, while also maintaining the international community's approval. Churkin also said that the deal will, hopefully, prevent another Middle East arms race and create a zone in the Middle East free of weapons of mass destruction, in his words. The United Kingdom (UK)'s ambassador to the UN Matthew Ryecroft went further, praising the deal as a "good deal" which allows Iran to take its "true responsibility" as a Middle Eastern power. Jordan's ambassador to the UN, Dina Kawar, noted that the agreement will hopefully "have a positive effect on all states in the regions," both in terms of foreign policy and in terms of various internal conflicts in the Middle East. She stressed the role of the International Atomic Energy Agency (IAEA) in implementing the agreement. Venezuela's ambassador to the UN urged the council to apply similar resolutions to enforce solutions to the "Israeli-Palestinian conflict." Iran's ambassador to the UN Gholam Ali Khoshrou praised the deal for "providing a way out" of the economic crisis from "unjustifiable" sanctions placed on Iran, which stemmed from "baseless speculations and hearsay." He added that there is "no proof" the nuclear program would be used for a weapon and protested that only Japan has had the number of the IAEA inspections surpassing Iran. "We cannot accept or forget previous treatment of Iran," he added. "Iran is both in a position and willing to comply" with the deal, he said, citing a fatwa of the Supreme Leader, Ayatollah Ali Khamenei, allegedly declaring nuclear weapons haram, or forbidden under Islamic law. He accused other members of the international community of "Iranophobia," particularly Israel, and accused Israel of stockpiling nuclear warheads and providing a "true threat" to the region. He also threw accusations against the US for destabilizing the Middle East and accused it of unjustly blaming Iran for doing the same.